Dry rot is probably the most important cause of postharvest potato losses in the northeastern United States and nationwide. Dry rot is caused by several fungal species in the genus Fusarium, thus the name Fusarium dry rot. The most important dry rot pathogen in the Northeast is Fusarium sambucinum, although Fusarium solani is also present. Losses appear to be increasing because F sambucinum has become resistant to the benzimidazole fungicides that are commonly used to control dry rot of potato. Thiabendazole (TBZ) has been applied postharvest since the early 1970s to control dry rot in storage. TBZ and thiophanate methyl, another benzimidazole fungicide, have been used to prevent decay of seed pieces caused by Fusarium species. Resistance to TBZ and other benzimidazole fungicides was discovered in Europe in 1973 and in the United States in 1992. Fusarium dry rot is characterized by an internal light to dark brown or black rot (fig.1) of the potato tuber-and it is usually dry. The rot may develop at an injury such as a bruise or cut. The pathogen penetrates the tuber, often rotting out the center. Extensive rotting causes the tissue to shrink and collapse, usually leaving a dark sunken area on the outside of the tuber (fig. 2) and internal cavities (fig. 3). Yellow, white, or pink mold may be present (fig. 4). Diagnosis of dry rot can be complicated by the presence of soft rot bacteria, which often invade dry rot lesions, particularly if the tubers have been stored at high humidity and condensation has occurred on the surfaces. Soft rot bacteria cause a wet rot that can very quickly encompass the entire tuber and mask the initial dry rot symptoms. Several other diseases and physiological disorders, including Pythium leak, pink rot, late blight, and suboxygenation (blackheart), also cause brown to black internal discoloration of tubers. Leak and pink rot are wet rots; tubers exude a clear fluid when squeezed. Late blight is a less aggressive rot that generally does not penetrate into the center of the tuber and causes reddish-brown lesions. Poor air circulation or extremes in temperature that result in low internal oxygen concentrations can cause a smoky gray to black discoloration of tissue, but the tissue is never brown and is very firm. Fusarium sambucinum and F. solani are commonly found on seed tubers but also survive for very long periods in the soil. Seed pieces decay when the pathogens infect cut or injured surfaces or when seed tubers are infected before cutting. 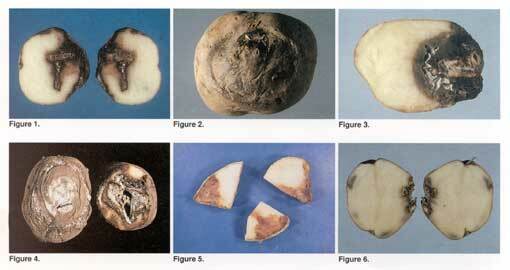 Tubers begin to rot either while they are being held after cutting or after they are planted. Precutting seed puts the tubers at risk for Fusarium dry rot, particularly if the isolate of the fungus is resistant to benzimidazole fungicides. The pathogen can move into the tuber through the cut surface and quickly rot the seed piece (fig. 5). Unfortunately, the temperature most favorable for healing the cut surface, about 55° F, is high enough to allow Fusarium to colonize the tissue. Seed decay results in poor stands and stunted plants. Progeny tubers are not usually infected until harvest because F. sambucinum and F. solani cannot cause infection unless they penetrate the skin and the potato skin is rarely injured during the growing season. Growth cracks, however, can become infected with Fusarium. Damage to tubers at harvest provides a multitude of points of entry for spores that are dormant in soil or on the surface of the tuber. If postharvest applications of a fungicide do not inhibit further development of the disease, the fungus begins to grow in the tuber tissue, causing dry rot lesions at the point of injury (fig. 6). The severity of dry rot in storage depends on the magnitude of injury. In storage the progress of the disease is limited primarily by temperature: the colder the temperature, the slower the disease will progress. Young tubers appear to have some resistance to dry rot which slows disease. Dry rot progresses noticeably faster during the last half of the storage season. If tubers with dry rot are planted, the seed pieces may decay. The fungus is very effectively spread during seed cutting and handling. In addition, the fungus is introduced into the soil, where it can survive and contaminate progeny tubers. When harvest occurs, the cycle begins again. Most techniques for managing dry rot are aimed at preventing injury to the tubers, either seed or the harvested crop. Preventing bruises will greatly aid in avoiding infection. Practicing the following procedures will help prevent dry rot. 1. It is critical to purchase seed that has as little dry rot as possible. Seed should be inspected, preferably during the last months of storage. If this is not possible, inspect seed carefully upon receipt. 2. Warm seed tubers to at least 50° F before handling and cutting to minimize injury and promote rapid growth. Cold tubers are very prone to shatter bruising. 3. Clean and disinfect the seed storage area before receiving seed. Knives on the cutter should be sharp to make a smooth cut that heals easily. Disinfect seed cutting and handling equipment often and clean up well between seed lots. Adjust the cutter and sort tubers to provide 2-ounce seed pieces that will provide substantial nutrition to the developing plant, even if some rot develops. Grade out obviously rotted tubers before they reach the cutter. 4. Treating seed pieces with fungicide helps control decay and other diseases caused by seedborne pathogens. Check current recommendations for specific fungicides. 5. Protect the seed from wind and sunlight during planting because dehydration greatly weakens the seed piece. Do not precut seed-it is best to cut only as much as can be planted within 24 hours. 6. Plant seed that has a Fusarium problem in warm soil and cover with as little soil as is practical. Coarse-textured soils warm up faster and are better drained than fine-textured soils. This allows the seed piece to suberize quickly and helps the plan to become established. Harvest tubers after skins are set and when pulp temperature is greater than 50° F. Use antibruise practices when harvesting and piling potatoes. 8. If using a postharvest fungicide, be certain that the coverage is adequate to protect the entire surface of the tuber. Use the volume of water and fungicide rate specified on the label. 9. Allow a period for wounds to heal before dropping the temperature in storage. There should be good air circulation, high humidity (greater than 90%), and temperature around 55° F.
10. Drop the temperature slowly to prevent condensation on the tubers and store tubers as cool as possible, considering your intended market. 11. Monitor storages often for dry rot. Market tubers with a significant amount of dry rot as soon as possible. Never grade tubers and place them back in storage because doing so spreads disease. Grade out rotted tubers when tubers are removed from storage for marketing.